Significant changes are occurring within our society, which is profoundly affecting the Financial Base and the ability of Local Governments and Non-Profit Agencies to assist Victims of Disasters. 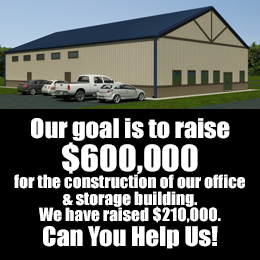 With the completion and availability of our facility with its mission as a Resource, it would be a tremendous asset to our community in assisting Victims or other Communities. In collaboration with the Red Cross of Wichita Falls Texas, we have help those in need by giving them major household items needed in re-establishing their lives to some degree of normalcy when they are least likely to help themselves financially or emotionally. Long Term Plans for our organization includes a Self-Sustaining Project, which is not being considered at this time. Our goal is to construct an Aquaponic Facility using land that we currently own. That Facility would permit us to grow Plants and Aquatic life. Products produced would be sold to help finance our operation and provide jobs. Plaquemine Parish, Louisiana – Hurricane Isaac – One Trip w/ 2 ea 24 Footer U-Haul Trucks. Wichita Falls, Texas – Mini Flood. Assisted 17 Families with more than 9 Tons of Furniture and Appliances.